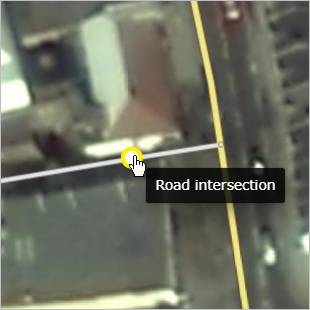 3.3.1.2. 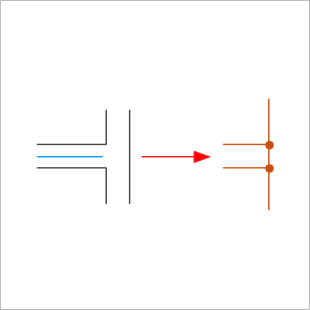 Rules for drawing roads in one/two arcs (one or two lines)). 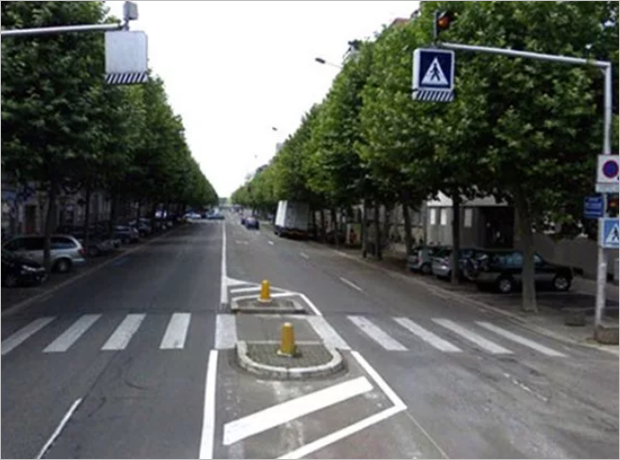 Be careful when drawing roads. 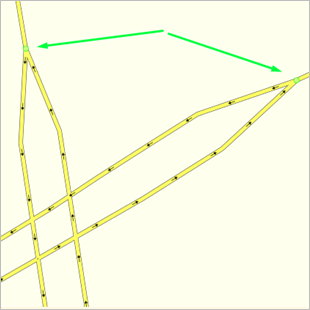 The road network is used to set routes, so drawing errors can lead to routing mistakes. 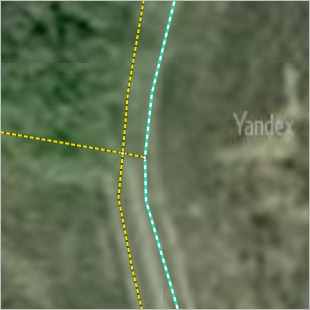 Techniques for drawing and editing road sections are similar to the techniques for drawing and editing all linear items on YME. 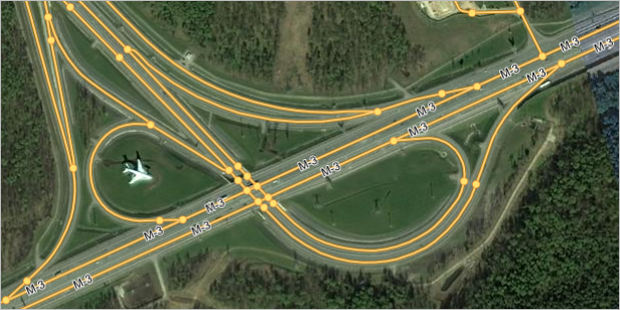 These are described in sections 2.6.1.1. 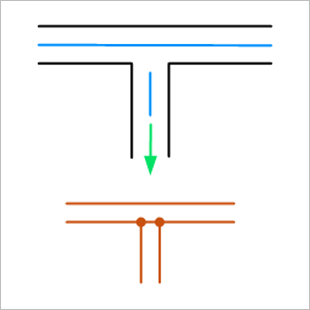 Drawing simple linear objects, 2.6.1.2. 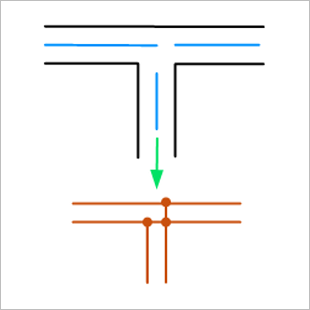 Editing simple linear objects. 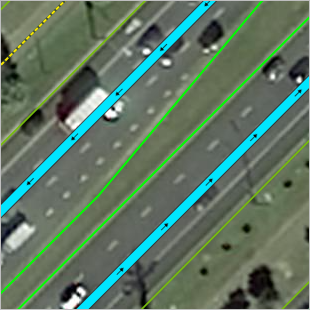 When you draw a road section, keep in mind that certain drawing rules relate to features of the road in question (rather than to that particular road section). 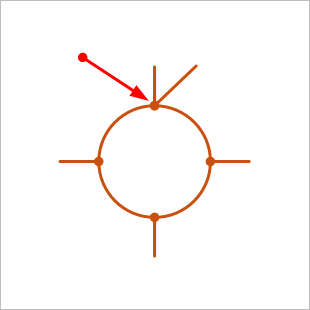 For example, some are drawn using one line and others — two lines (for more information, see point. 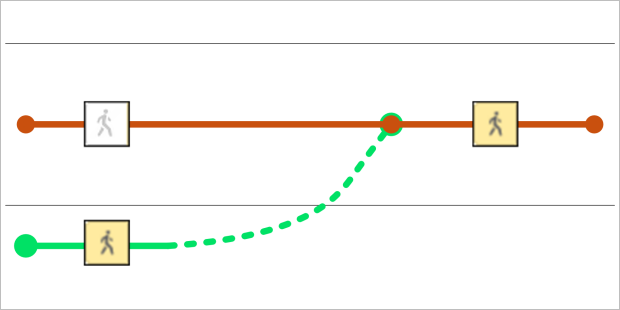 3.3.1.2. 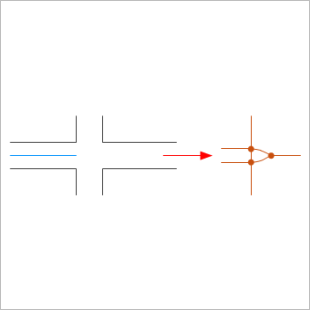 Rules for drawing roads in one/two arcs (one or two lines)). 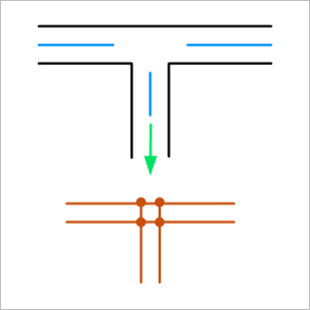 When drawing road elements, the points where the road elements intersect (the start or end point of each element) form independent objects of type “Intersection”. 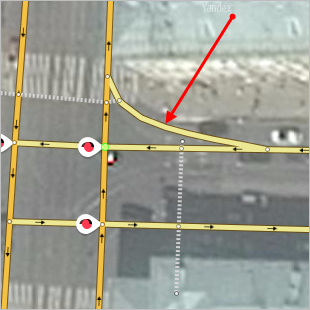 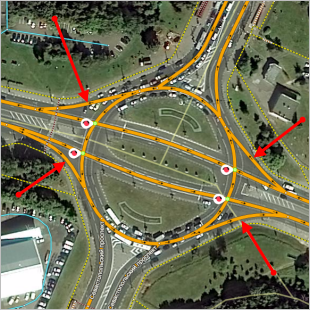 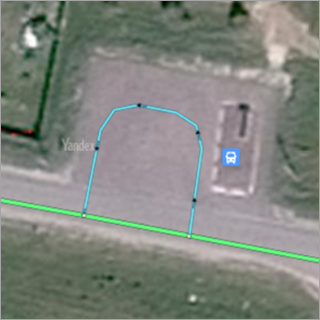 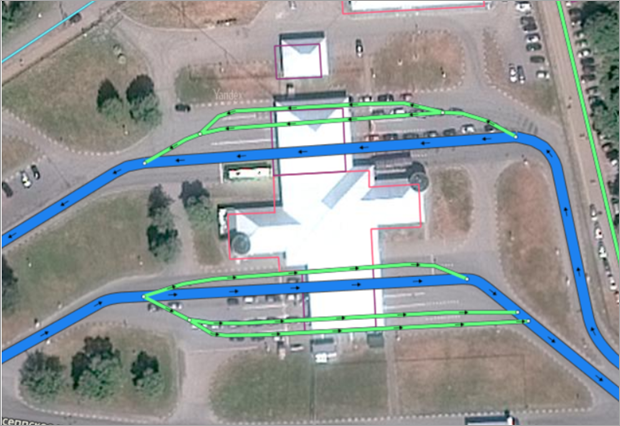 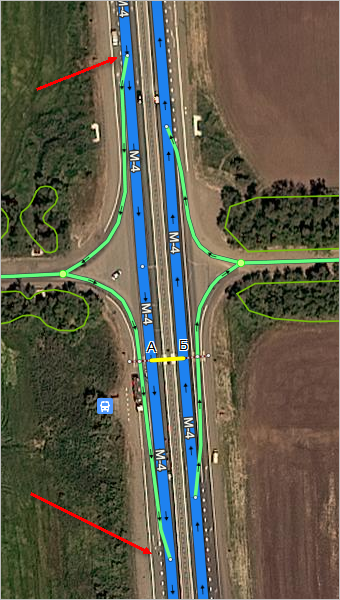 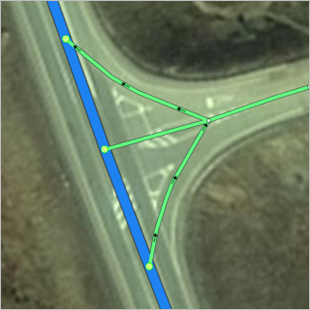 Intersections are created automatically when you draw road sections and may be used to edit the shape of the road network (for more information, see section 2.9. 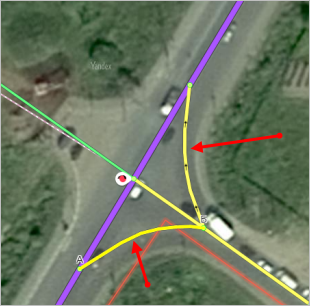 Intersections) and when entering road signs, traffic lights, and speed cameras. 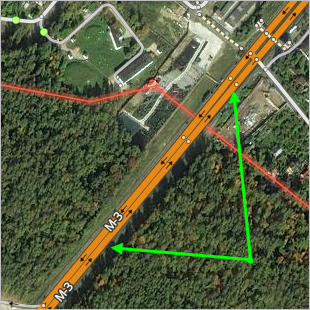 If you can only get to a certain “isolated” road section by railroad or ferry crossing (but not by motorway), then the road network should include these railroad and ferry crossings, and you should add attributes to them accordingly (see section 3.3.2.6. 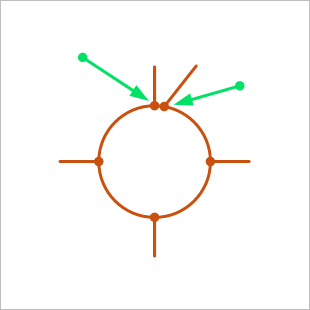 Type of structure. 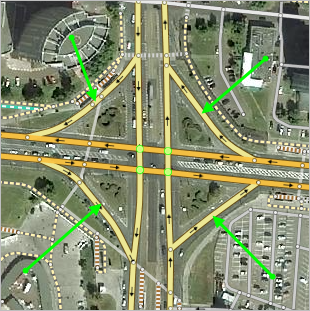 Roads that are under construction can be connected to road networks via lower-class roads (see point 3.2.11). 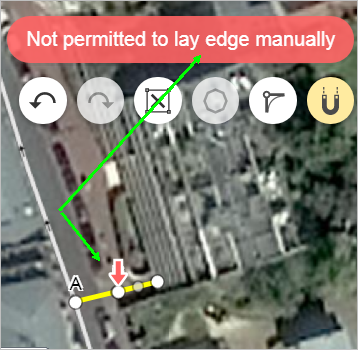 But not all errors are recognized automatically. 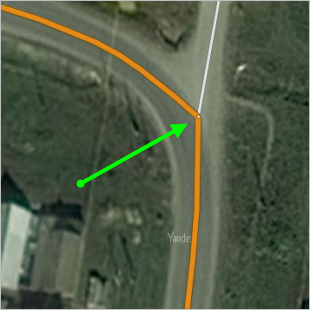 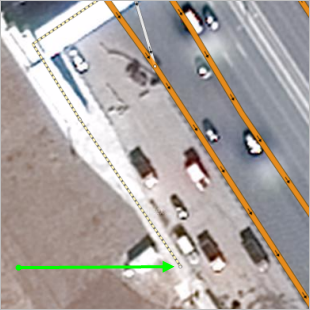 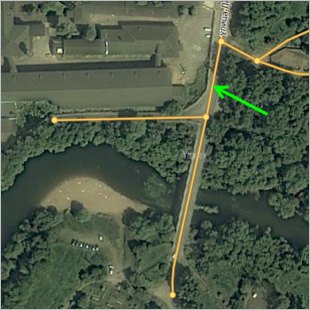 When you draw road sections that go over bridges, pay attention to the displacement of the bridge on the satellite image (for more information, see section 2.3.1.4. 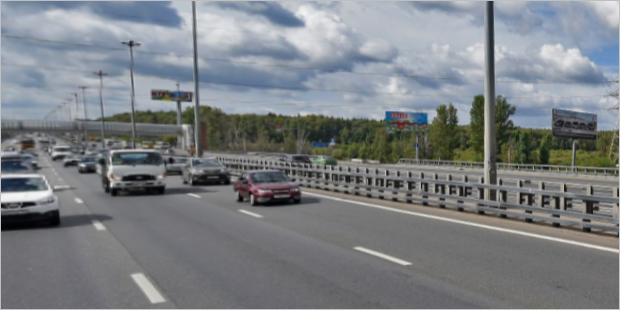 Bridges). 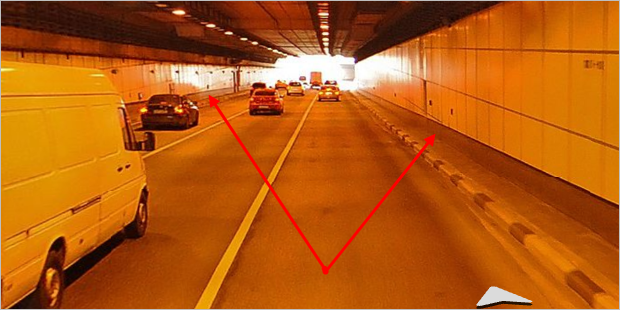 Don't draw roads in underground and multi-level parking structures and roads that lead to the roofs of buildings (such as in mall parking lots). 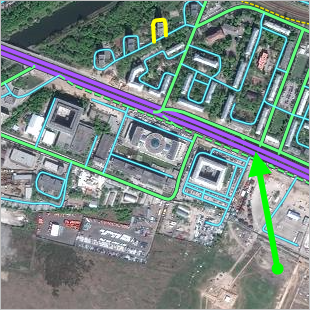 See Section 3.8.2.1. 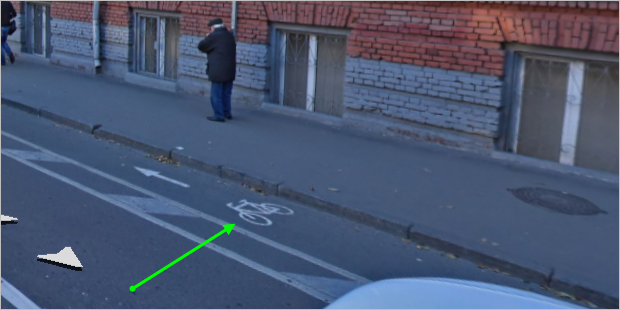 Rules for drawing parking spots. 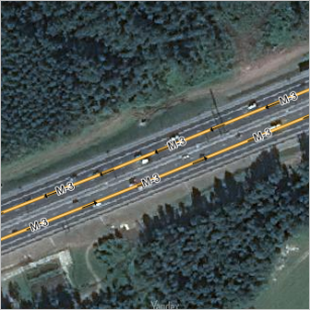 Motorways that cross through several countries (which are usually Numbered highways like the M-1 in Belarus, the M-2 in Crimea, etc. 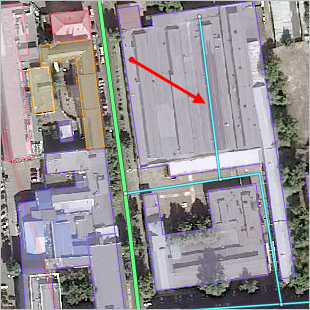 ), are broken into fragments at national borders. 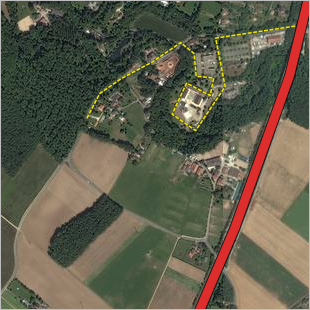 On territories that are regularly developed, vegetation may intersect with motorways that are class 10 (Pedestrian and bike paths), 9 (Forest and field roads) or 7 (Roads of minimal significance) and are only accessible to pedestrians and/or bicyclists. 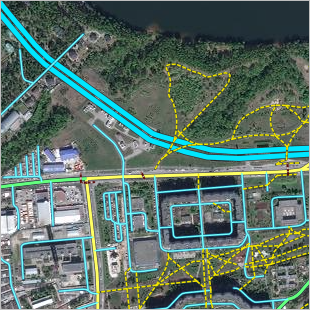 Outside of territories that are regularly developed, vegetation may intersect with railways and motorways that are drawn using a single line. 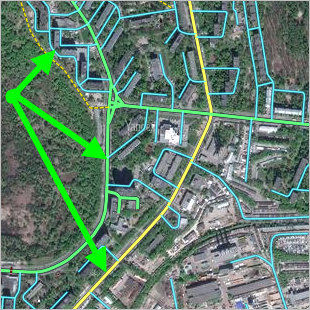 Both outside of and on territories that are regularly developed, vegetation of the “Park, square”, “Nature reserve” and with “Cemetery” types may intersect with motorways of any type if these roads are exit ramps to these areas of vegetation or passages through said areas. 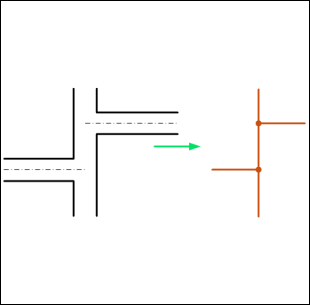 When you draw roads that intersect with locality borders, you must split the border at the intersection point (creating two road sections). 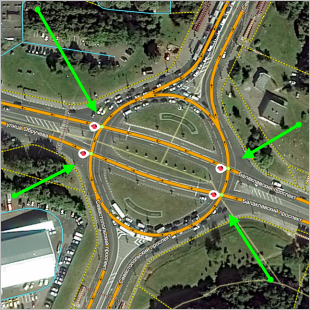 Don't change the main road's shape if you're drawing the road expanding and getting new lanes near toll booths and border checkpoints. 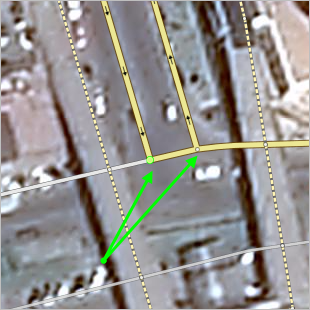 Checkpoint passages don't need dedicated lines. 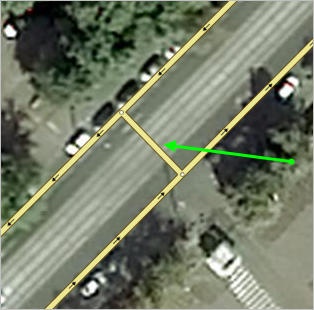 Every road, not having characteristics two-lane roads (see 3.3.1.2.1) must be drawn in one edge. 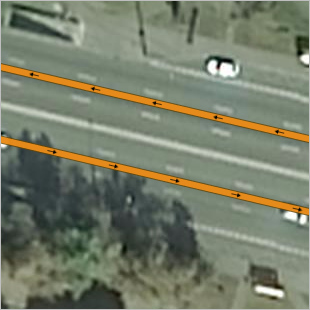 For a short section of road, you should not switch between drawing one and two lines (even if the number of lanes or the road markings change). 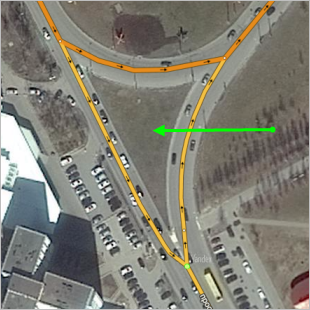 To draw a smooth turn on a road, you can use the round corners tool or command. 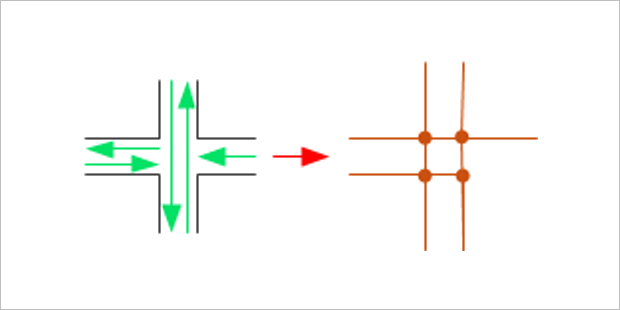 If the turn is part of a T formation at an intersection, adhere to the rules for drawing these types of intersections (see point 3.3.1.5.3.8). 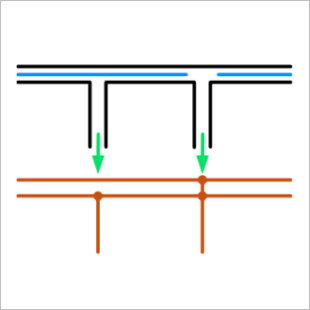 See also section 2.10.2. 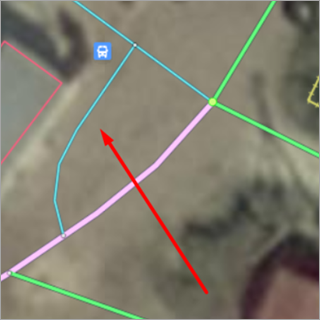 Map items: related edits. 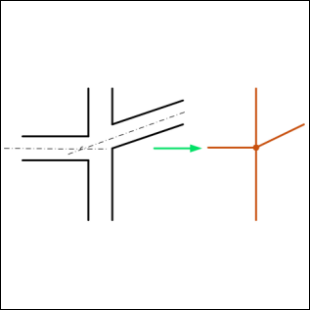 Draw a two-way u-turn in fragments that run perpendicular to the lines you drew on the road. 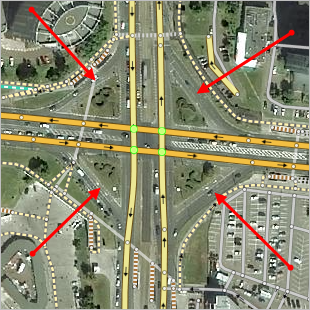 Draw intersections to reflect the actual traffic situation there (in other words, take traffic signs, permitted turns, etc. 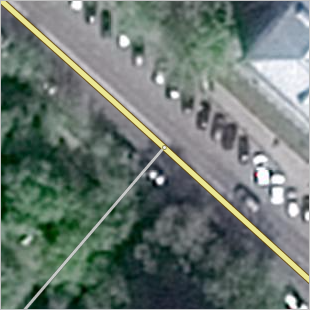 into account regardless of if the roads that intersect there are drawn using one or two lines). 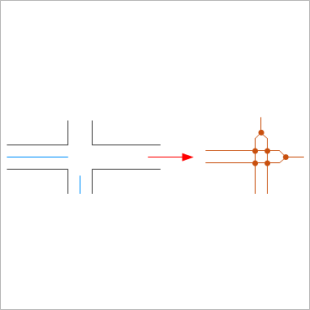 If a road intersects with two different roads that only differ by name (in other words, the driver can navigate from one to the other without performing any maneuvers), then enter one general intersection point that applies to both of them (see upper drawing). 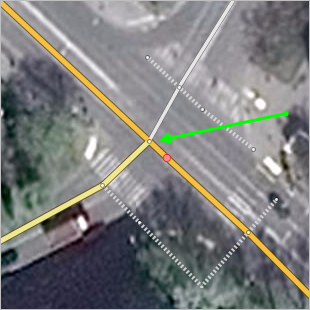 Draw the intersection formed by an exit ramp and the main road at the location where the solid line that marks the exclusive exit ramp begins or ends (not the location where the solid line that delineates the exit lane along the main road starts or ends). 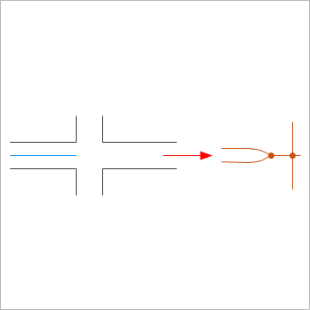 Make the convergence of a two-line road into a one-line one smooth (see point 3.3.1.2.4). 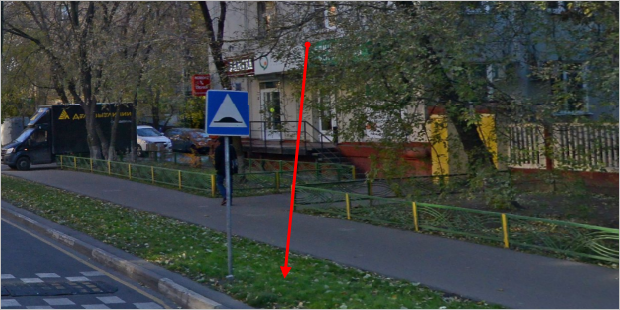 This rule applies to all classes of roads, including pedestrian paths. 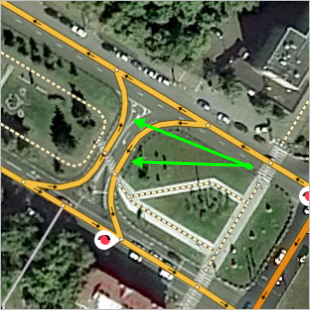 Draw intersections where a high-class road turns and adjoins a less significant road in a similar fashion. 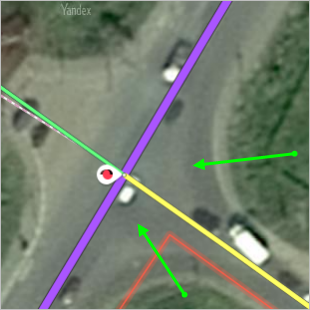 When you draw pedestrian roads and sidewalks, you can use road color-coding to represent Pedestrian accessibility (i.e. 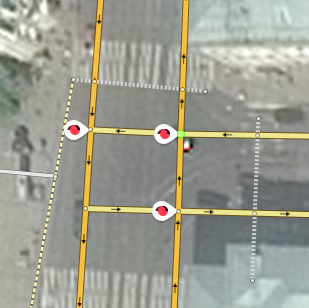 use different colors to show whether or not a road is accessible to pedestrians). 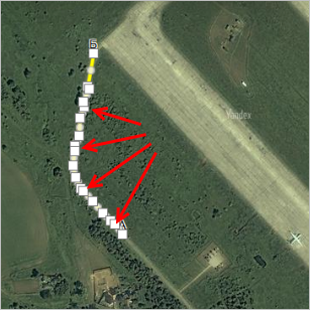 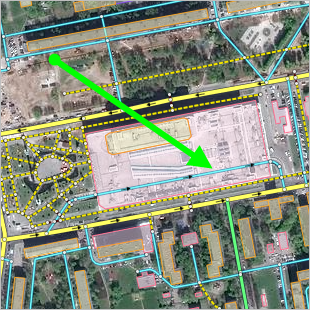 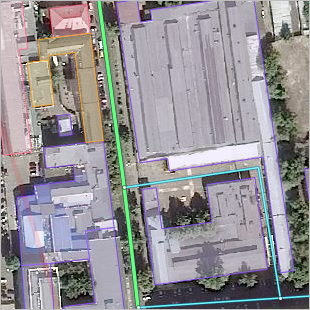 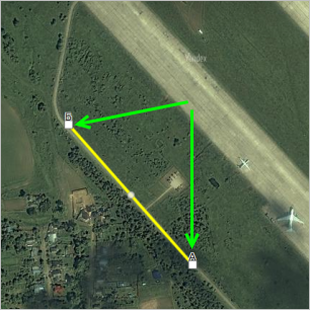 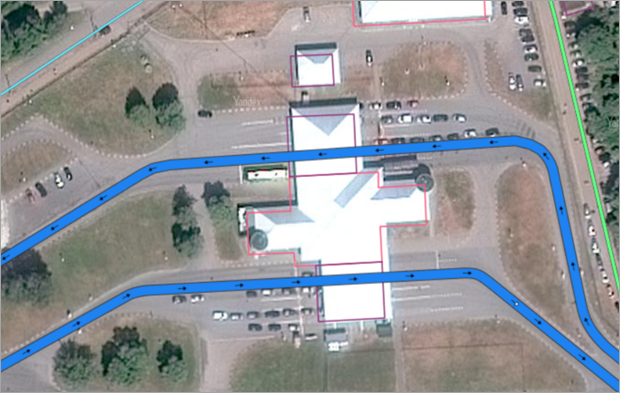 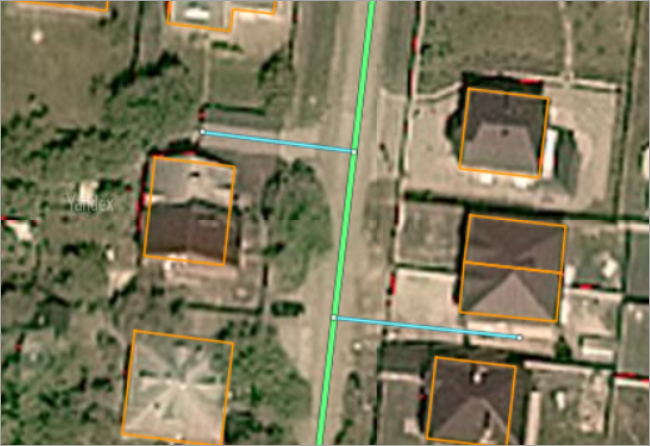 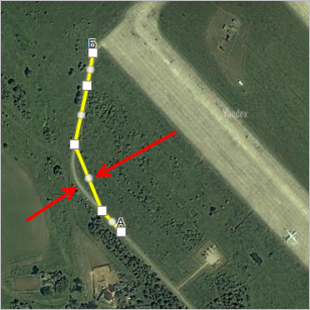 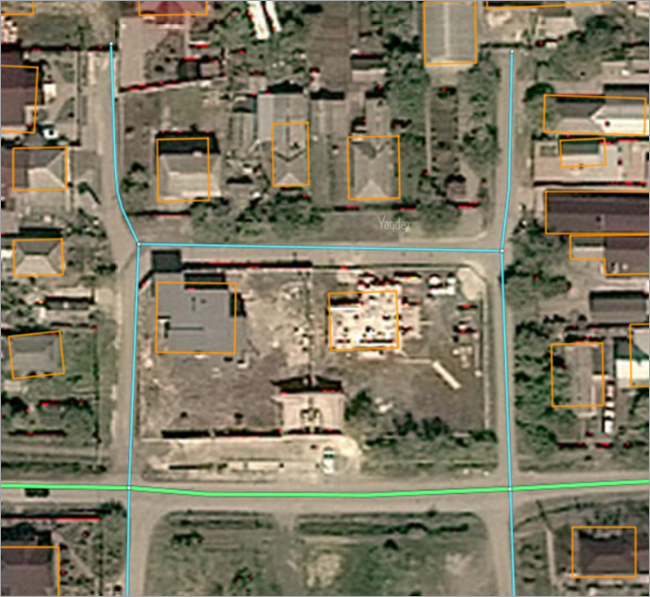 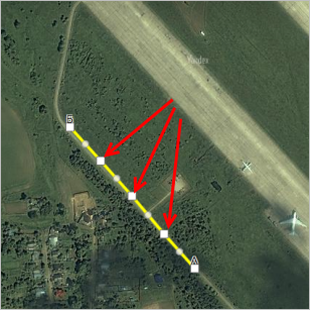 Do not draw too many unpaved pedestrian roads (paths) on a restricted area (for example, in a single courtyard), even if they can be discerned from a satellite image. 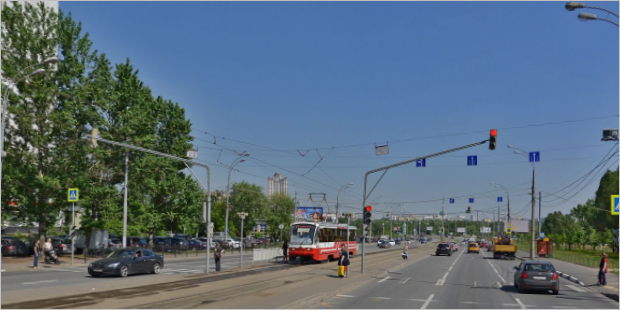 It is necessary to single out the key points among them (providing access to public service points, public transport stops, etc.) 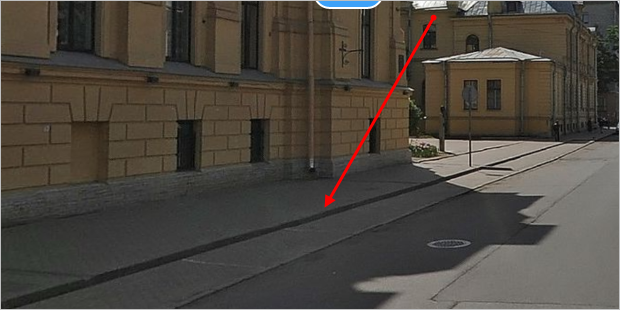 and draw only them. 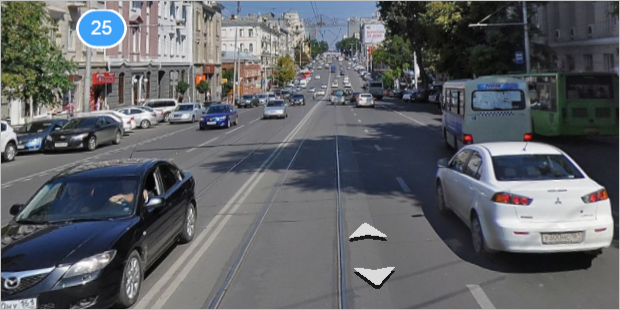 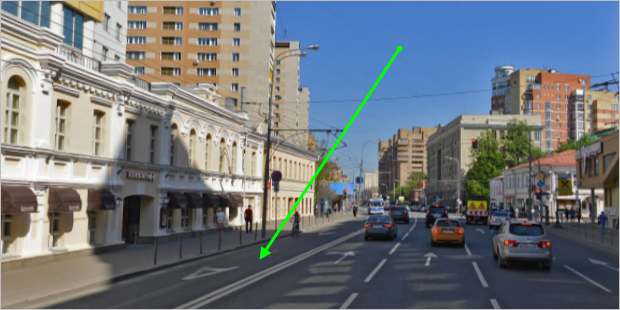 Significant pedestrian paths (such as Arbat St. in Moscow) are class 7 (“Streets in localities”); set the access as pedestrian-only for them. 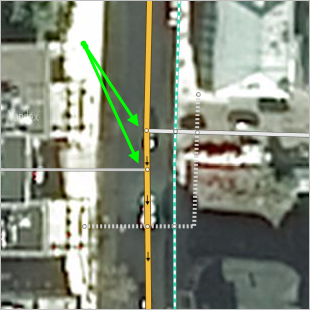 Sidewalks, pedestrian and Bicycle paths are drawn on a conditional basis. 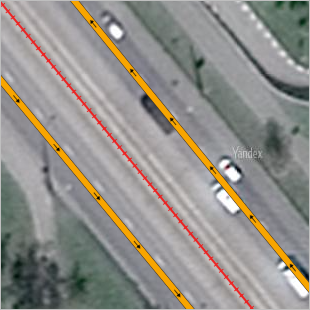 “axial” lines. 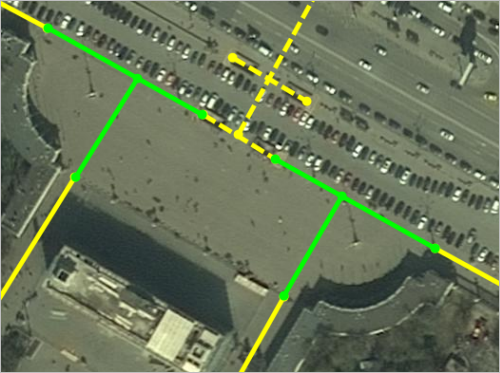 Lines representing pedestrian crosswalks, sidewalks, and pedestrian zones should form a connected network with the entire road network as a whole. 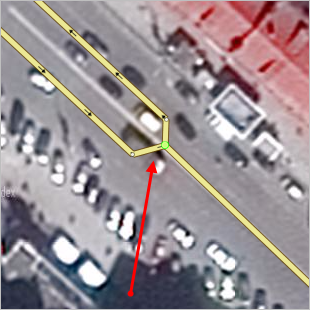 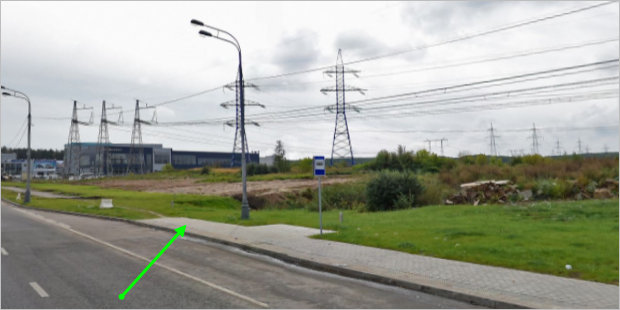 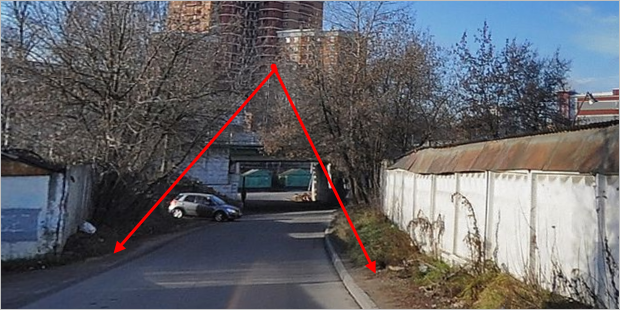 Networks of alleys and pedestrian roads running through parking lots and cemeteries should connect in the proper location to sidewalks and motorways that have the accessible to pedestrian attribute marked. 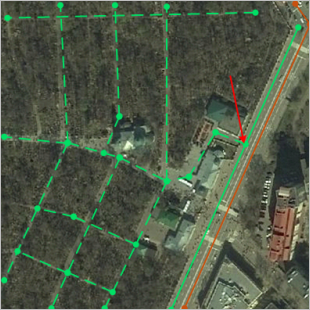 Fragments of the road network accessible to pedestrians might be disconnected from one another. 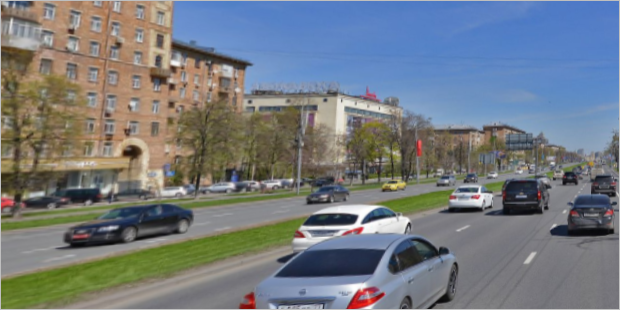 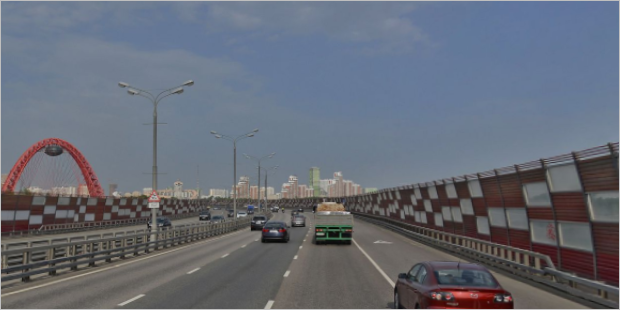 For example, the pedestrian roads on the island of Kronstadt near St. Petersburg form a network that pedestrians cannot reach from other areas of the city (they only connect to the A-118 freeway-ringroad). 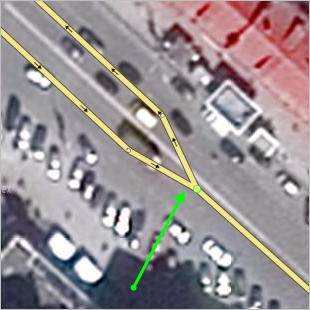 In similar situations not follow artificially link the isolated sections of the road network available to pedestrians to each other, indicating accessibility to pedestrians where it is not available. 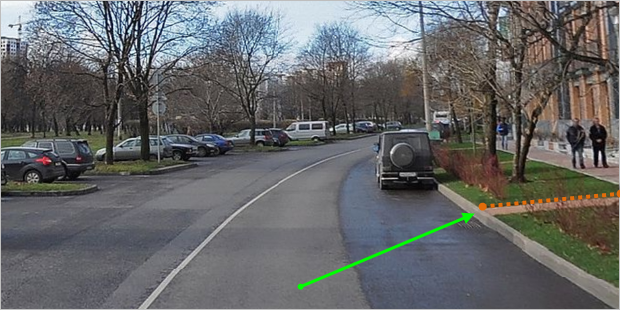 Draw sidewalks as separate roads if the sidewalk is separated off from the roadway by a physical barrier (grass, fences, etc.). 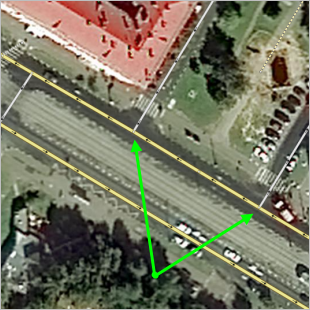 The shoulder of a highway is not considered to be a sidewalk; do not draw it as a separate road. 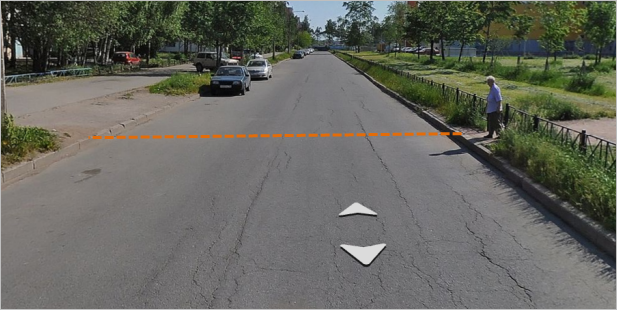 If the shoulder of a road segment is accessible to pedestrians, then don't draw it as a sidewalk running along that segment, but rather add the accessible to pedestrian attribute to the applicable segment. 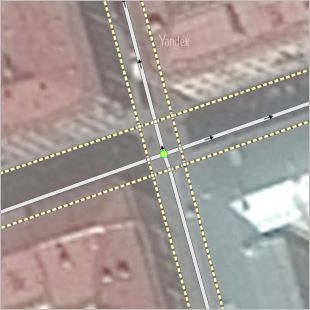 Draw lines representing pedestrian crosswalks down the middle of the crosswalks themselves. 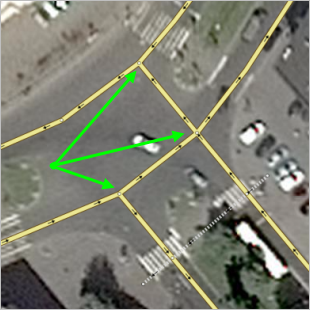 If the pedestrian crosswalk ends at a square that is accessible to pedestrians, then the points where the crossing ends and the entrance to the square begins are connected using segments of hypothetical pedestrian paths. 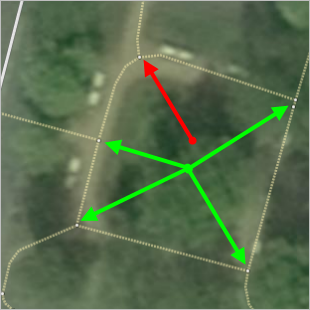 Draw these paths at right angles from each other (if possible) and keep their use to a minimum. 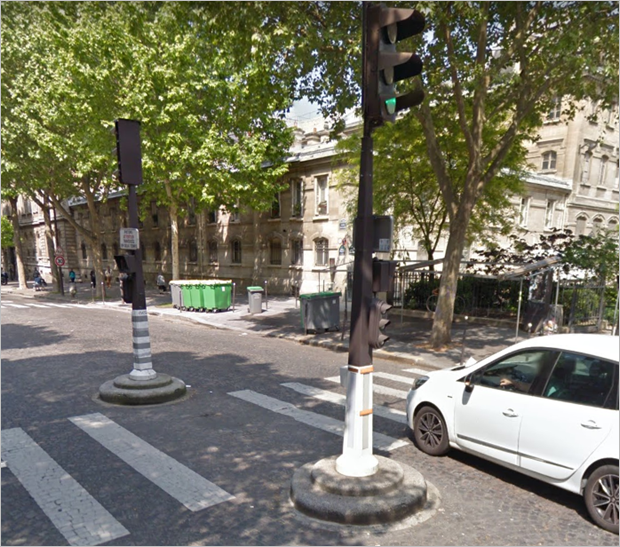 Draw double pedestrian crosswalks (i.e. 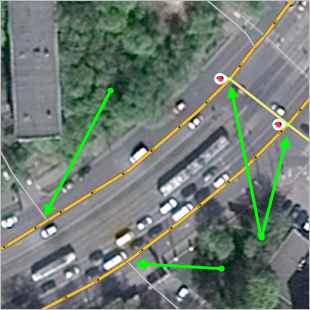 when two “zebra crossings” are located close to each other and you can only go in one direction on each of them) as a single line with the direction of traffic going both ways. 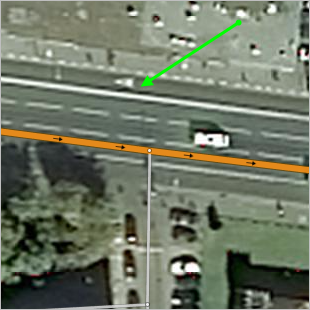 In all other cases it is enough to set the Accessible to bicyclists attribute for those sections of motorway (or pedestrian) roads. 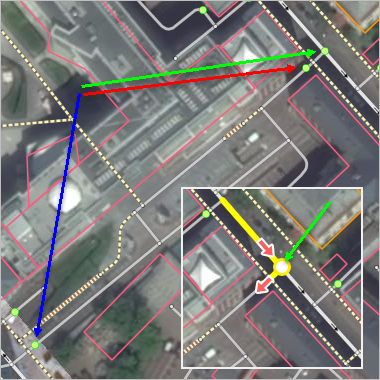 Don't draw pedestrian roads that go through interiors of buildings. 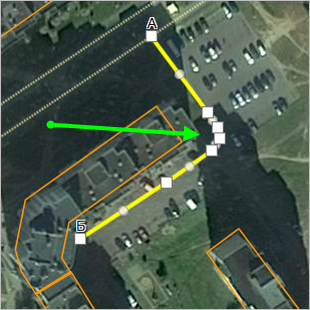 Exiting will remain unrestricted (i.e. 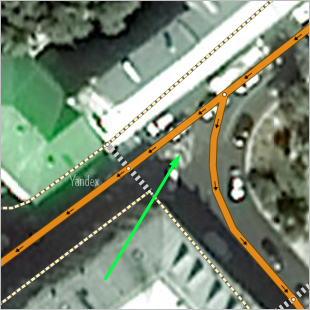 you do not need to link the intersection with an exit restriction). 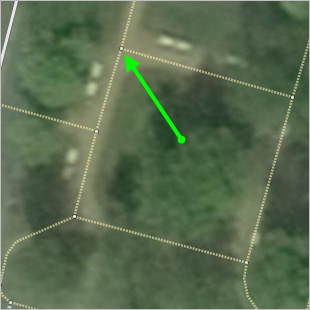 If there are several entrances to a territory (one for guests, one for service personnel, etc. 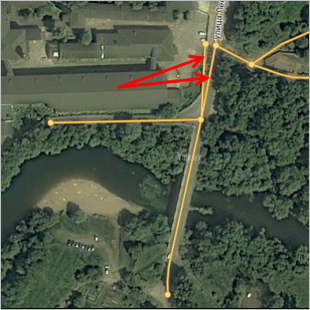 ), then add a Restricted entry “road sign” to all the entrances. 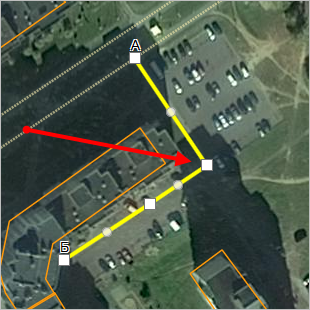 For service entrances, you should also add a Restricted maneuver road sign at the closest road intersection to “the area affected by the sign”. 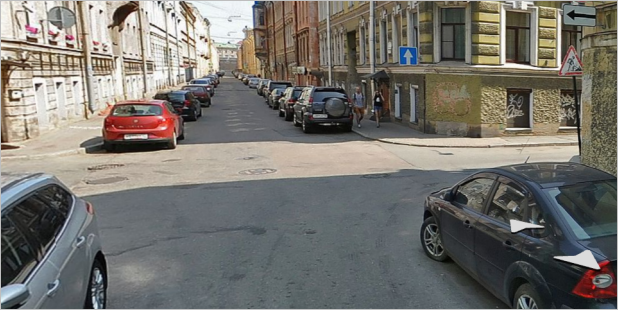 Use the “Restricted entry” sign (see point “3.3.1.7.1”) to represent the “Traffic prohibited” or Motor vehicle traffic prohibited signs that appear on city streets: these restrictions allow one to reach their home or workplace but restrict general traffic. 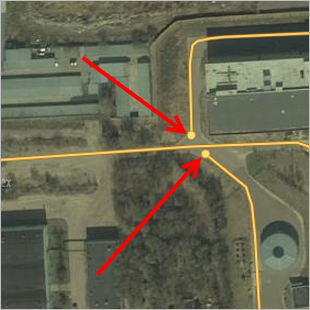 Place “Restricted entry” sign directly at the road intersection after the actual location of the sign. 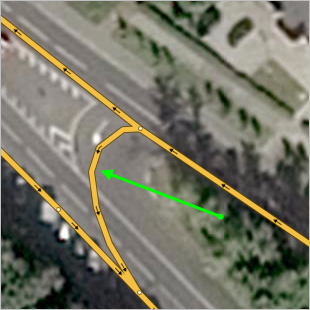 When drawing the road network on a territory that includes checkpoints or lifting gates, assign the road section accessibility value that reflects the real-world situation. 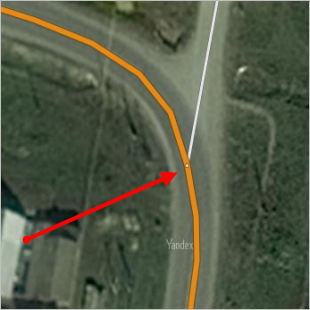 If it is technically possible to travel within the borders of the territory in question, there are no additional restrictions by vehicle type posted on road signs, and an Entrance by Permit sign was already placed at the entrance or exit, then you should not remove the vehicle accessibility attribute. 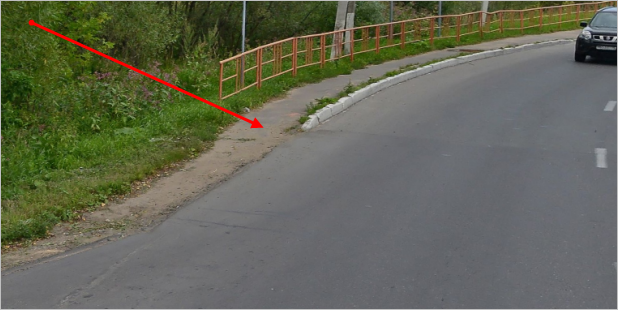 Where a road sign is installed “No entry” road cut. 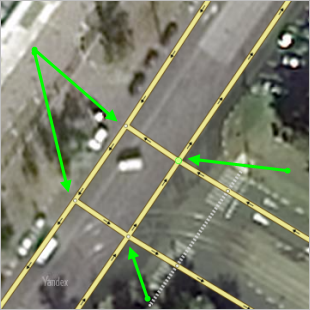 C formed intersection contacts condition of movement type's “Prohibited maneuver” (prohibits travel under the sign). 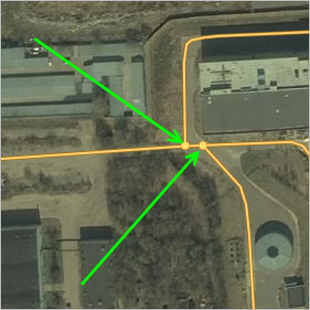 When the road network is drawn this way, it does noes not split at the location of the barrier, but no routes can be plotted that intersect with the barrier. 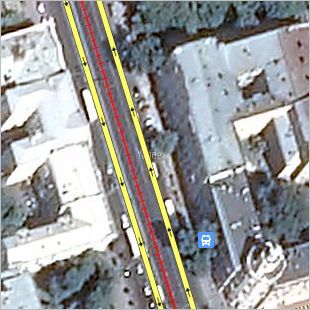 If driving is prohibited by traffic regulations (marking or road signs), but special documents (passes) allow part of the vehicles (or a specific car) to ignore the ban (for example, some trucks are allowed to ignore the ban on the entry of cargo transport inside Moscow's TTK), the traffic condition is affixed on a General basis: Prohibited maneuver, not Entry and entry restrictions (see para. 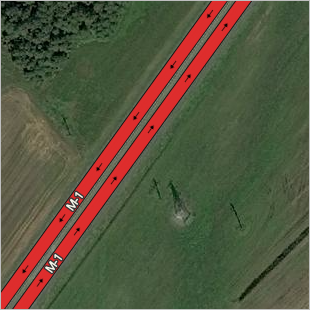 3.3.1.7.4).